Canberra Electrician - COMMERCIAL Sparks Fly Electrical is Canberra's best electrical service. SPARKS FLY ELECTRICAL - We specialise in all commercial electrical service needs. With years of experience and all the know-how, we provide electrical service, install and repair to all areas across Canberra and Queanbeyan. Email or phone us on: 0422 574 463. Our fully-licensed electricians and data technicians provide superior quality electrical installations to commercial sites throughout Canberra and Queanbeyan. With an extensive knowledge of the electrical industry & regulations, we are well equipped to perform a range of jobs, no matter how small, large or complex. Need a new shop fit out? Were happy to help with all your commercial needs, as well as more complex work. We provide complete electrical fit-outs for new commercial business plus renovations, as well as any other electrical installations you need, electrical repairs, maintenance, data, computer and phone cabling, Digital TV antennae and points, RCD & smoke alarm installation, and any fault finding you require. We are ACMA licensed for all phone and computer cabling (CAT5,CAT5e,CAT6) installations and repairs. Being Canberra based electricians we are conveniently located and are able to respond to all calls throughout the Canberra and Queanbeyan area promptly. 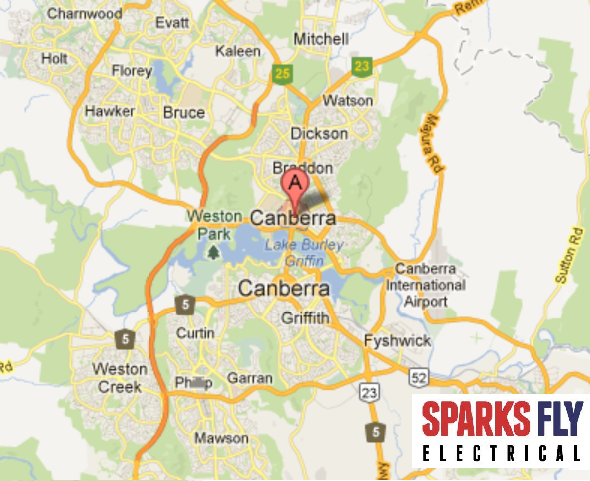 SPARKS FLY ELECTRICAL services to all areas across Canberra.